Social media is not about having a large following. The marketing results of your social media efforts are seen and generated when your audience engages with your brand, and thus builds their trust in you. In addition to that, it is only when you get your audience engage that you get an opportunity to make an impact on them in an effective way. In this article, we’ll provide you with 7 Clever Ways To Improve Your Brands Social Media Engagement. Your followers spend a lot of time engaging with your posts and brand on social media, so the least you can do is show your appreciation to them. Show your appreciation by giving something they value. It doesn’t necessarily have to be money. Most often, it’s not. Your social media followers can unfollow you at any time, so if they are the only ones who give and give without getting anything in return, there’s a big chance they will. However, don’t simply give away free things just for the sake of giving. Reward your followers in a good way because that will also help your brand image. If you basically throw things away, there’s a chance you’ll risk harming your brand image instead. 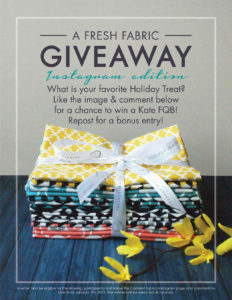 Here is a giveaway done right (including an appealing visual image) by Camelotfabrics. Giving away things to your audience is always appreciated, but take this chance to also gain something from it as well. A good idea is to get people to sign up to your newsletter because even after the “giveaway” has ended, you’ve introduced them to your funnel. Also, giving away your own products can help spark an interest in them as well, and potentially attract the winners (and non-winners) to buy them in the future. If you have a website, and you have traffic, you’re missing out on a huge opportunity if you’re not implementing social share buttons on it. Implement buttons through which individuals can share your work on their online networking profiles. The only issue with these is that if they display a number of how many social shares you have gotten so far, it might have a negative effect if they say 0 shares. In addition to that, the competition on most social platforms has become extremely tough, so as a result, sharing unique killer content is really the only way to stand out. Here are some statistics to understand just how much visual content is being distributed across the most popular social media platforms. On Facebook, there are over 350 million photos being uploaded daily. If you succeed in sharing appealing content, you’ll automatically attract people with the help of your fascinating and convincing pictures Thanks to this, you can build your audience and broaden your reach. Many brands are displaying themselves with a fancy logo and brand name, but this puts a distance between you and your audience because they can’t feel any close relation to a person that is the face forward. Most times, your audience won’t even know who they are talking to. A tip to get personal on Twitter is to join recordings. Recordings on Twitter enhance online networking engagement, yet keep the recordings short. This is a good approach to get a more individual connection with your audience and to build trust with them. Tell your audience who it is they are dealing with when chatting with you so they know the identity of the person they are conversing with. This enables the conversations to wind up and become more individual. There are plenty of ways you can boost your Facebook page to enhance the engagement of your audience. Utilize the photograph collections to exhibit your representatives, and share updates about your co-workers. This makes your image more relatable. Utilize Facebook messages to welcome new audiences to your page and brand, and ask personal questions to reduce the gap between brand and prospect. Use Facebook to highlight your fans, regardless of whether they’ve won a challenge, presented an audit or simply sent you a photograph or video of them with your image. Don’t forget to thank them in the most genuine way possible. The important part here is to show them that you don’t forget about them and appreciate all your engagements. With Google+, it is vital that you share your Circles with your adherents. Not only would this enable you to gather your audience to get more data about them and what you can do to share content that resonates better, and gets them more engaged, it will also help you get closer to your audience as well. Offer Circles that are applicable to the business like journalists, speakers, and industry pioneers. Be dynamic in Communities. Join or create one and take part in community conversations. With LinkedIn, you should participate in Groups to be able to get more personal with people. Join discussions, answer questions, and basically, interact with anyone who’s interested with your brand – or potentially could be interested in your brand. Doing this will improve your brand’s visibility, and as a result, lead to an increased brand awareness. Reading these tips 7 Clever Ways To Improve Your Brands Social Media Engagement, it might seem easy to improve your social engagement, and it is – if you do it correctly and consistently. But to achieve the best results, you need to put in hard work, and you’ll see results. Don’t just expect your followers to engage with your brand after a few small changes. It is only when you engage with your audience on a regular basis and make them feel comfortable enough that they will start to engage with you regularly.